Produce Show? "What's that?" I said. I honestly had no clue what to expect - but anything that involves lots of fruits and veggies: count me in! Veggie Heaven. Veggies. Fruit. Produce as far as the eye can see! New products, trends and marketing promos. But as much as I loved the abundance of produce on display - my favorite part of the day was chatting with the representatives of the companies whose goods I buy and eat everyday. I kept thinking, wow these folks must love me - I'm vegan! Vegans are kinda like their biggest customers! ha. Everyone was there! Name a produce company - they were there! 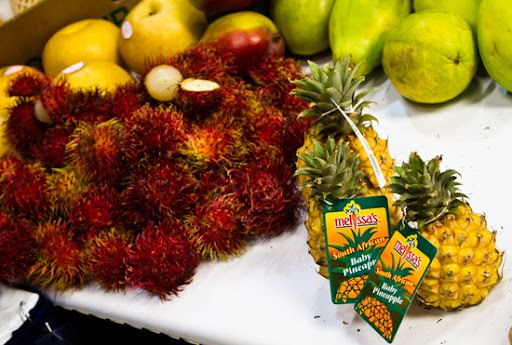 Melissa's, Calavo, Bolthouse Farms, Nasoya, Del Monte, Sunkist, Dole, Chiquita and more. I was kinda starstruck, er veggiestruck? I wandered around the floor going up to booths with glossy eyes, mumbling how much I love their produce or products. I felt like a Twilight fan telling Robert Pattinson how much I love him. Only instead of vampires, I was raving about produce. 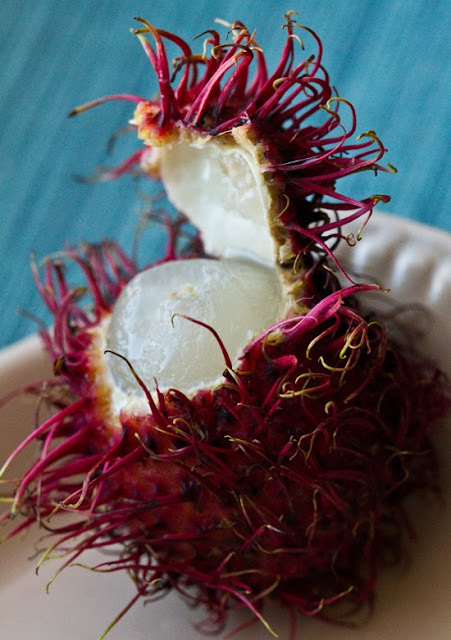 1) Don't Fear the Rambutan! 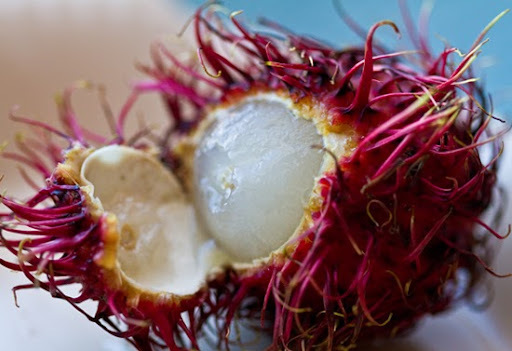 Funny, I always feared the Rambuton with it's spiky pink skin. 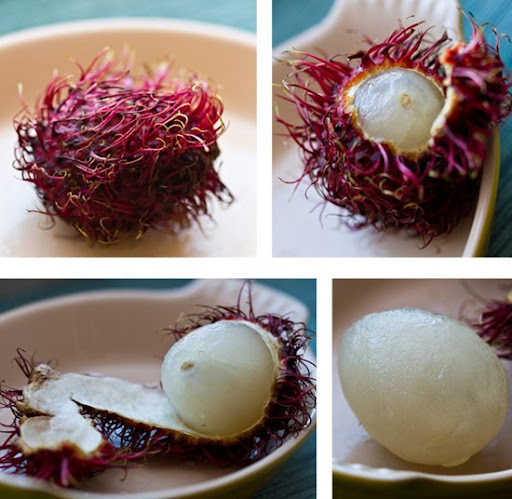 But I learned that a Rambutan is easy to peel - easier to peel than it is to pronounce. Easier than peeling an orange! The skin is soft and pliable. 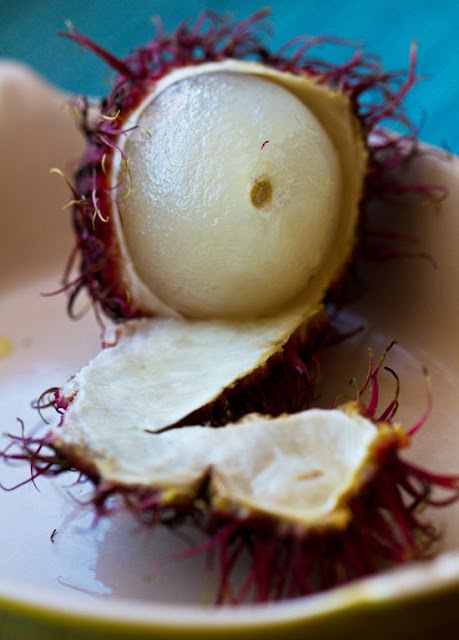 The tender, slick fruit inside tastes rosy-sweet/tart - like a lychee. Thanks Melissa's Produce for letting me take one home! Such a pretty fruit..
2) Veggie Vending! Vending Machines for tomatoes are possible! And pretty cool. Sunset brand machine. 3) People Hate Brown Food! I spotted lots of foods that don't turn brown when they oxidize (avocados, apples). 4) Mache (mosh) is Posh! The trendy green Mache is not pronounced "ma-shay" but rather simply, "mosh" - Also, Mache is high in naturally occurring Omega 3's! A 3oz. serving contains 12% RDA of Omega 3 fatty acid. Mache is also a healthy source of potassium, folic acid, iron, zinc, lutein and vitamins A & C. ..all from the Epic Roots brand you've probably seen in stores. 5) Eat Veggies for Breakfast! The latest trend in the produce world is getting people to use ordinary fruits and veggies for out-of-the-ordinary uses and meals. Like using veggies for breakfast. It's all about changing your mindset and stereotypes about certain foods. Did you know that a baked potato with the skin on has just as much potassium as a banana? Hmm, breakfast mashed potatoes anyone? I kid. Seriously, I love this idea. I've long been a fan of eating salads for breakfast. I especially love 'creamy' chilled salads in the morning with lots of chopped nuts/seeds on top. My vegan Seedy Tahini cole slaw made a yummy breakfast bowl as I recall. It's OK to crave greens in the morning and oatmeal and fruit at night! Eat outside the box. 6) Fortified Tofu - genius! Nasoya now carries a new product called TofuPlus which is fortified tofu. There is also something called Sprouted Tofu. They also carry Fortune Cookies as part of their line! 8) Lemongrass Flavor from a Tube! 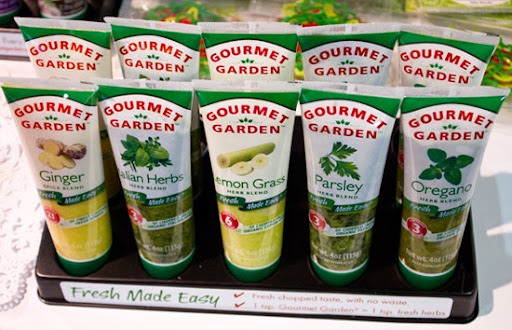 Gourmet Garden herbs and spices (a company which originated in Australia) has cool tube-based herb and spice blends. Everything from basil to garlic paste to Italian herbs and more. My favorite was the lemongrass flavor. I gave it a taste and it was salty, moist and full of flavor! So much easier than buying a stalk of lemongrass. 9) Stringless Snap Peas! 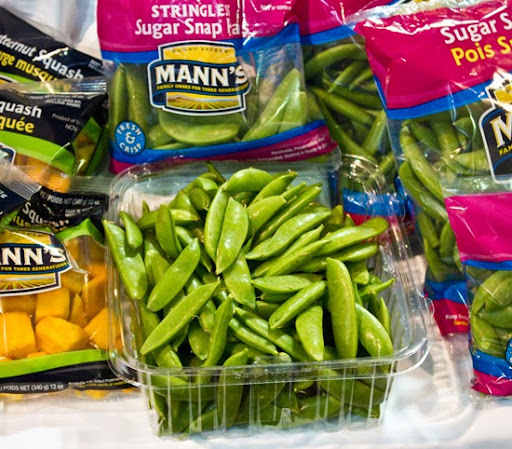 Mann's (a 70% woman-owned company) Snap Peas come in a cool "stringless" form - peas without the thick vein. Kinda neat for the vein-phobes out there who don't like the chewiness of traditional snapeas. Another Mann's fun fact: Mann's created/own the registered trademark for "Broccolini" - the veggie with thin broccoli-like stalks. 10) I like the Perishable Pundit. 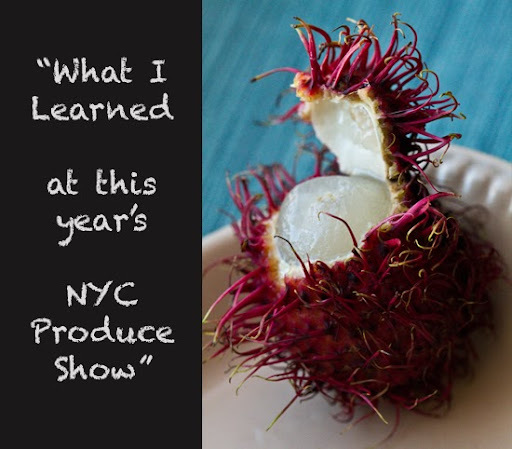 Produce Show founder, Jim Prevor, has a blog called The Perishable Pundit, in which he discusses his latest finds and discoveries in the world of produce - including events, health studies, brands and more. 11) Tweeting Veggies is In! 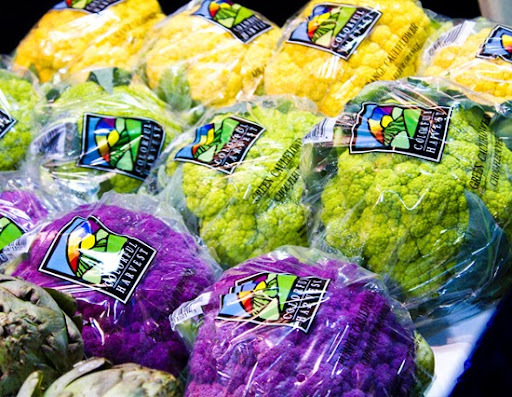 Yes, even the produce industry is social media savvy! Many companies told me to check them out on Facebook and Twitter. 12) Consumers are Lazy. Just kidding, sort've. ..there was a huge emphasis on packaged goods that were ready-washed, ready-to-eat and the bags were even microwave-friendly. I'm not a fan of microwaving veggies though, because they won't taste as good as when you roast, boil, saute, braise or grill them. 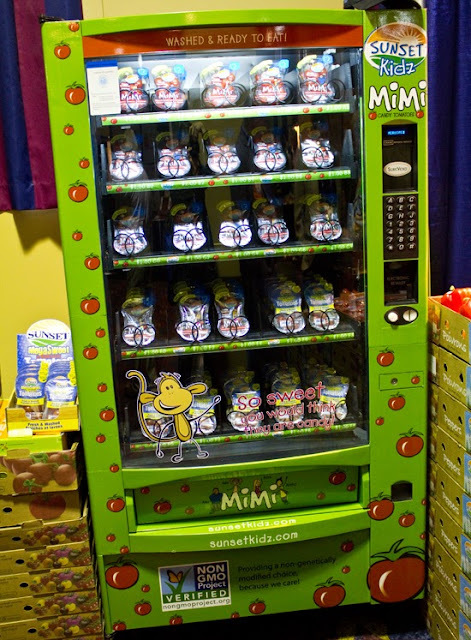 13) Selling to Kids. 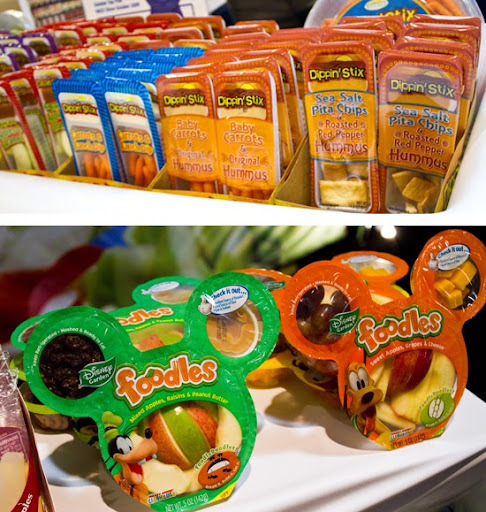 Lots of kid-themed products including dipper combos (hummus with crackers, apples with peanut butter) There was even one in the shape of a Mickey Mouse head. 14) Avocados - that don't brown! 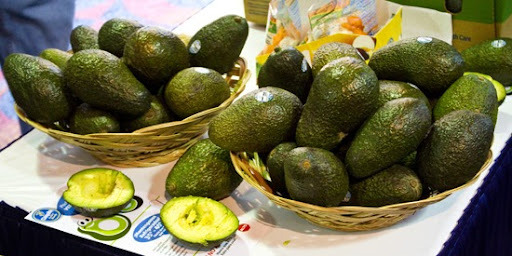 Chiquita was showing off its Peruvian Avocado that does not turn brown when sliced open! Really, it sat out for hours and was still bright green. It has something to do with increasing the amount of moisture in the avocado. Here is a cool blog of someone who experimented with one. Chiquita also has packaged apple bites (great for kids) that don't brown. 15) People are Generous. If you ask the Calavo avocado guys nicely, they will give you a bag of avocados. And the Foxy guy was glad to give me a box of strawberries to take home. I like free fruit samples! 16) Organic is Still in. "Local" is Growing. 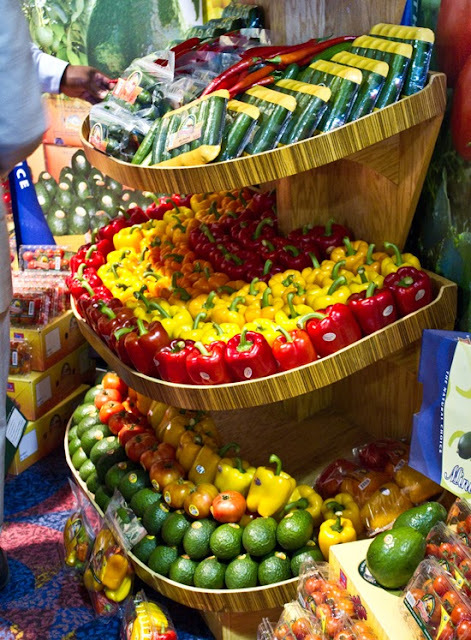 Organic produce is still in demand. And the organic trend is in essence what re-ignited the "local" farm-to-table trend in restaurants because Chefs 'organic' status wasn't as unique anymore. Restaurants have turned to using the locally-sourced philosophy to differentiate themselves. 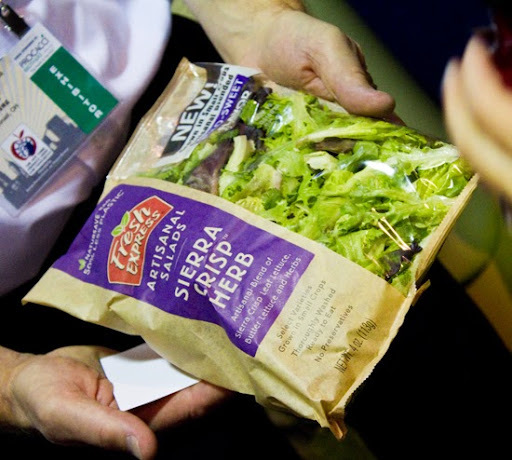 17) We Want a Vegan Salad Kit! 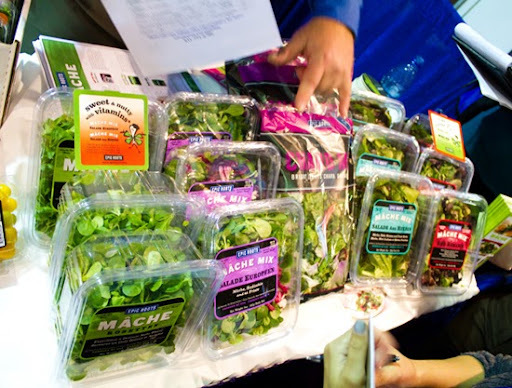 Fresh Express has a cool new product with Artisan Lettuces - that are so sweet and flavorful you can "eat them without dressing". I noticed they also have a new Strawberry Fields Salad Kit. I then asked them if they were experimenting with any vegan soy-based protein salad kits. He said no. But don't you think that would be a great idea?! So many chicken salad kits - why not try a tempeh/seitan or baked tofu salad kit! Fresh Express: what do ya think? Reminder: Veg is in. 18) Consumers love strawberries! In the Salinas Valley, strawberries continue to triumph. Strawberry fields have taken over a large percentage of the farming crops - where there used to be artichokes, greens and brussel sprouts, there are more and more strawberries! 19) Kids Like Characters. Companies like WPRawl (family-owned since 1925) are using entertainment outlets like TV programming (Lazy Town show) to market their veggies to kids. They call it Sports Candy! ..Remember how Popeye made spinach big? Same thing. 20) Produce: it's a Family Thing. Many of the companies are long-time family-owned businesses passed down for generations. I like that. 21) Mini is In! Mini-sized produce varieties are not only adorable, but quite trendy (if you can find them in stores). 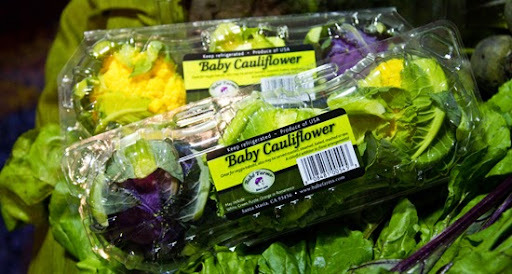 From mini pineapples to mini baby cauliflowers. Fun and cute. 22) Produce Growers are Proud! The reps at the booths were proud and excited to talk all about their products. I felt right at home - all these people so excited about fruits and veggies! 23) Trend: Salad Toppings. Dry mixes of pre-blended mixtures of seeds, nuts, dried fruit, spices and more. 24) Chefs are King. 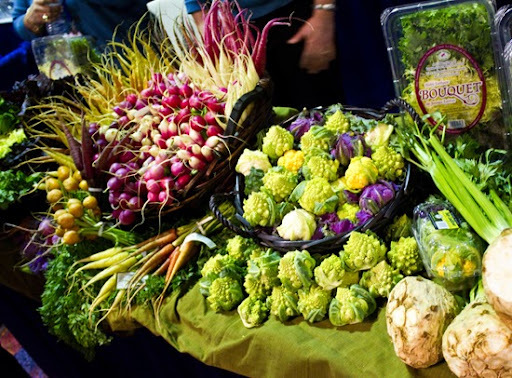 Chefs offer creative ideas to the produce industry. Chefs (and bloggers!) can help consumers see that a grapefruit can be eaten in different ways than simply as a breakfast half grapefruit. A number of companies are working with Chefs to create featured recipes using their produce (example: WPRawl is working with Paula Deen). There were chefs at the show doing cooking live demos. 25) Trend: Black Garlic. The live cooking demo at Christopher Ranch's station featured black garlic - and it smelled fantastic! 26) Foxy Lettuce. The produce brand "Foxy" was not named after a fox, but actually named after the 70's hip slang term "foxy" - as in, "hey groovy babe, you're foxy!" Hope you all learned a few new things from my list!